Handicap parking at the Smithsonian Natural History Museum is available on Madison Drive across the street from the main staircase leading up to the museum. Unfortunately, the handicap entrance with a ramp is on Constitution Avenue. If you are unable to walk stairs, this will require quite a walk around the entire building. If you are with an abled driver, this is no problem. Have that person drop you off on the Constitution Avenue side of the Natural History Museum and then come around and park in one of the handicapped spots on the Madison Drive side. A good meeting place inside the museum is by the enormous African elephant under the dome. Once you are inside the museum, you will have no problem. There are ramps and elevators as needed. Nonpartisan Pedicab offers specialized tours for disabled and handicapped visitors to Washington DC. A private tour of the monuments with an experienced guide is the perfect way to get around if you are disabled. It is easy to get in and out of a pedicab and very comfortable. We are very knowledgeable about all the sites in DC. 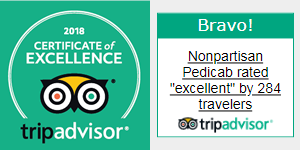 We can pick you up right from your hotel or parking location or from the Smithsonian. You can see all the monuments on the National Mall in 2-3 hours. At the end of the tour, we can drop you off at the Smithsonian Natural History Museum or any other location of your choice. How Many Disabled Spots are There at the Smithsonian Natural History Museum? Not many. Just a few. If you are not successful in getting one of these spots, keep driving straight on Madison Drive to the Smithsonian American History Museum — the equivalent of 3 blocks distance. There are several handicap spots here as well. The Ronald Reagan Building has a huge underground parking lot, and it is not far away. The entrance is on 14th Street between Constitution Avenue and Pennsylvania Avenue. It is open 7 days a week 24 hours a day. All day parking on weekdays is $25 (4-15 hours) and on weekends it is $15. 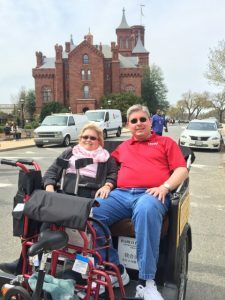 A pedicab tour of the National Mall and the Monuments is the perfect way to get around if you are disabled. It is easy to get in and out of a pedicab and very comfortable. We are very knowledgeable about all the sites in DC. We can pick you up right from your hotel or parking location or from the Smithsonian. You can see all the monuments on the National Mall in 2-3 hours. At the end of the tour, we can drop you off at the Smithsonian Natural History Museum or any other location of your choice.